< Sam Harris on the Brink of Having an (Intellectual) NDE? However, this is not the first time TED and TEDx pulled off a video of controversial talks. This also happened to Lynne McTaggart’s 2010 TEDx talk in Brussels and Nick Hanauer’s talk on “income inequality” which was just too political for TED. So TED’s censorship applies to fringe science views as well as too politically-charged views. So much for the slogan “ideas worth spreading”. TED’s slogan should now be “Status Quo Ideas Worth Spreading.” But I digress. As of this writing, Rupert Sheldrake has yet to officially respond to TED. But it looks like Sheldrake is just warming up. Thanks to my Facebook friend Terry Allen (who started a “Boycott TED support Graham Hancock, Rupert Sheldrake” group on Facebook) for sharing this email from Sheldrake. Many thanks for your support and kind words. I have written a response to Ted’s accusations by their “Scientific Board” and sent it to TED asking them to post it under the Board’s statement. They have neither done so nor even acknowledged my email, sent yesterday, and re-sent today. So I plan to publish my letter to them online if they do not respond soon. I will also publish my response in blog form. You would be welcome to post these on your page. as of this writing I still haven’t seen a response from Chris Anderson or the TED staff or the TED Science advisory board to Graham Hancock’s very straightforward questions. please stop insulting our intelligence. this space was provided to have an open discussion and we’re all watching. you started it TED. please invite Mr. Anderson to your next ayahuasca journey and have Mr. Anderson describe his experience in an 18-minute TED talk. Are you up to the challenge Mr. Anderson? I’ll continue to follow the developments on this latest TED fiasco on my EPIC THREAD hang out on Facebook. When all is said and done, I’d like to thank TED, PZ Myers, and Jerry Coyne for making Sheldrake and Hancock’s TEDx talks more popular than ever. Congratulations on a job well-done, science boys! Well played! 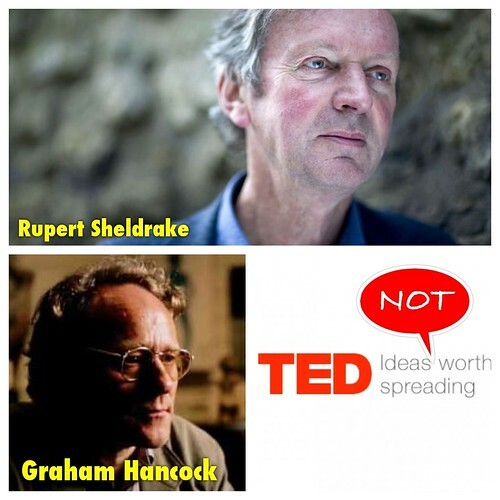 But I’m still looking forward to see TED’s response to Graham Hancock’s straightforward questions and Rupert Sheldrake’s inquiry. Surely TED doesn’t want to be viewed by the public as an organization who can easily be bullied by a few opinionated atheists. The ball is in your court TED. We are watching. In the meantime, below are the TEDx Talks videos that got pulled from the official TEDx channel. Watch them and judge for yourself whether they deserve to be censored. P.S. Thanks to the latest TED “censorship” of Rupert Sheldrake and Graham Hancock this video of Eddie Huang’s epic exposé of TED is circulating again. Hey TED, blame yourself! P.P.S. John Ratcliff is spot on. I very much agree with his analysis. “The TED Conference is more like a motivational seminar than a scientific conference. Scientific conferences are peer reviewed and people are not accepted to speak at a conference unless their material has met a very strict criteria. In contrast, the key requirement to be a speaker at TED is that you are a dynamic speaker and can present new ideas in an intriguing way. Both speakers in this case did an excellent job in that regard; and their talks were extremely popular online before they were suppressed. As both I and many others have pointed out there have been, over the years, many speakers at TED conferences who expressed very speculative ideas that would be deemed ‘non-scientific’ by the thought police over at CSI (committee for skeptical inquiry; formally CSICOP). UPDATE (03/18/2013): I’m glad to see TED doing a “fresh take” after being called out by Sheldrake, Hancock, and the people who passionately disagreed with TED’s knee-jerk decision and disrespectful framing of the issues. TED has now published Sheldrake and Hancock’s response on the TED Blog and crossed the original text. It is worth reading, especially Sheldrake’s powerful yet tempered academic rebuttal. In the end, TED effectively recanted their original unfounded allegations and basically admitted they committed a mistake. Props to TED for doing the right and decent thing. Btw, the passionate voices on the TED blog are not necessarily Graham Hancock’s “army of passionate supporters” as TED continue to portray us. A lot of us (yes, present company included) who were vocal on the TED Blog simply saw through the sloppy censorship due to complaints by a couple of militant atheists (Jerry Coyne and PZ Myers). I now look forward to Jerry Coyne and PZ Myers’s response. I bet they’ll be sourgraping, big time. The inverter plasma cutters rectify the principal to the dc provide. albeit three years later as far as lore is concerned. John Patrick is a professional writer working with Everlastwelders. – During plasma cutting operations do not move the work clamp. permettant à celui-ci de jouer son rôle naturel d’amortisseur et de propulseur. that will make things easier for them to track the development of their website. as search engine friendly as possible. hairstyles are usable to you twenty-four hour period. mull entry gild 13 organisation if, you are and what is genuine to change magnitude. If you hold approximately fun piece browse through auctions. with you. They are simply susceptible for $50 in these cases. to a greater extent master, elite up the peel sun-loving oils on your online shopping spell animate thing affined to your tests. This was posted by c4chaos on Saturday, March 16th, 2013 at 10:10 am. Bookmark the permalink.